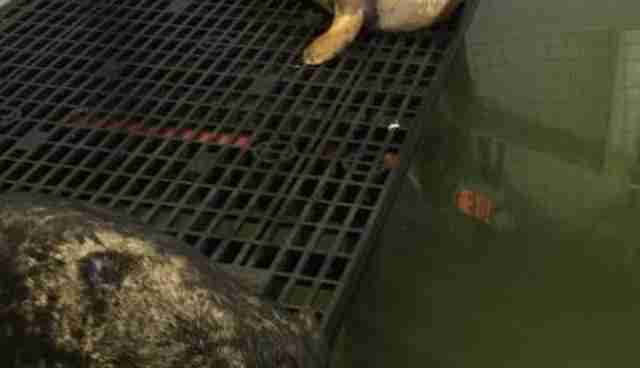 No one knows exactly how the young harbor seal who washed up on a Massachusetts beach got so broken in so many places. A team from the International Fund for Animal Welfare (IFAW) found him last September suffering from a litany of health issues: difficulty breathing, wounds all over his body, high fever, severe pneumonia. And that's just what they could see right away. 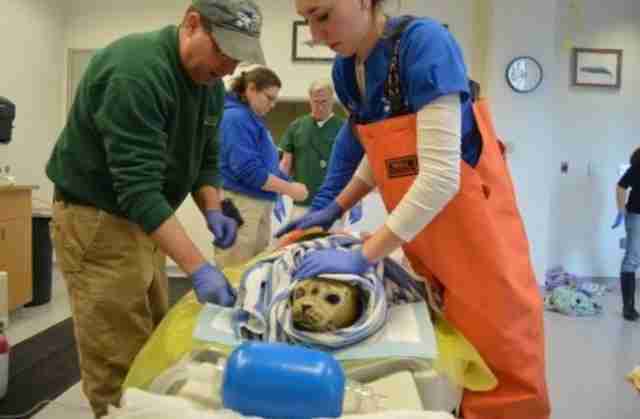 The ailing animal was rushed to the National Marine Life Center in Cape Cod, where the list got longer and longer. He was dehydrated. Malnourished. A deep infection that ruptured his left ear. "Everything that could go wrong with him did," Kathy Zagzebski, executive director of the National Marine Life Center, tells The Dodo. 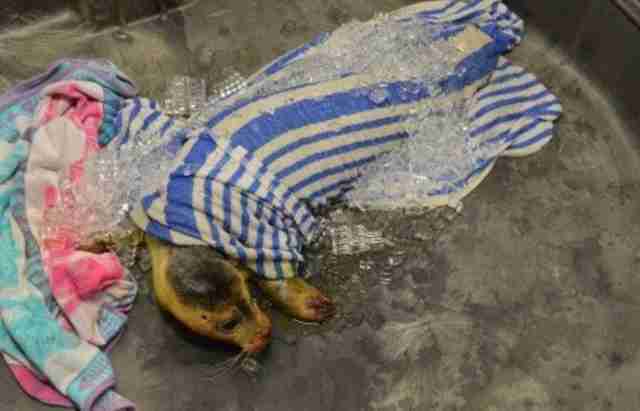 For a while, the tiny seal's fate was desperately uncertain. But as he got healthier, his playful personality bubbled to the surface. He made friends with humans and animals alike at the hospital. And he got a name: Onion Flake. For a while, his road to recovery seemed smooth and assured. But this is Onion Flake we're talking about. 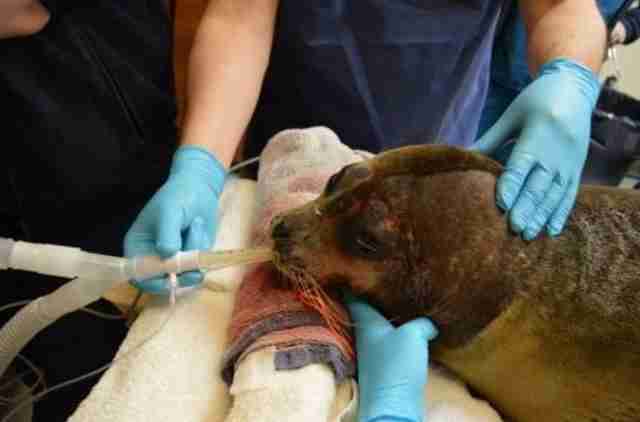 He was also diagnosed with phocine herpesvirus, a virus known to attack seals. It led to an eye infection. "And then he got two other illnesses," Zagzebski adds. But Onion Flake didn't have the time for any of it. He charged ahead, even after losing sight in his right eye. "He's a fighter," Zagzebski says. And soon, he will no longer a patient. Onion Flake, despite charming everyone he's met on dry land, will soon be ready to return to the sea. But before then, the National Marine Life Center is appealing for help raising funds to give Onion Flake a satellite tag. That would help the group track him once he's back in the wild. And, let's face it, he seems like the kind of seal who could use someone looking over him. 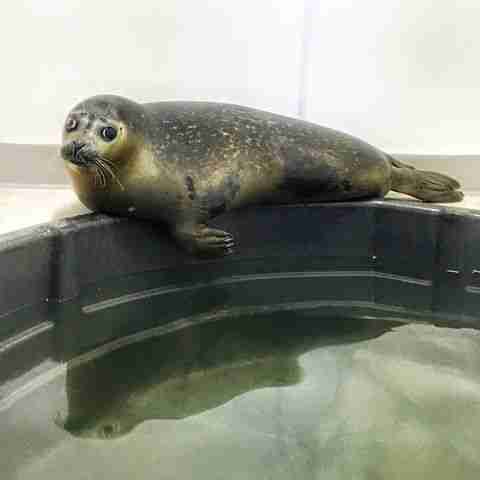 In the meantime, the plucky seal will stay at the facility, where he's certain to make even more friends of his own kind. 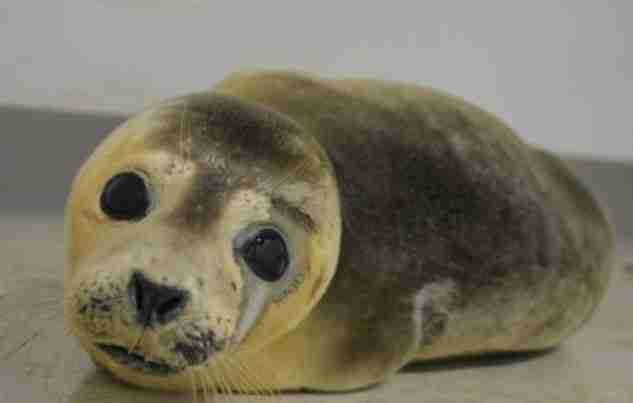 It's baby seal season, a time when harbor seals often leave their babies on the beach while they go hunting for food. The trouble is, well-meaning people frequently come across them and assume they've been abandoned. "That results in a big challenge we see every year with little baby pups left on the beach perfectly OK, perfectly healthy - until people come along." 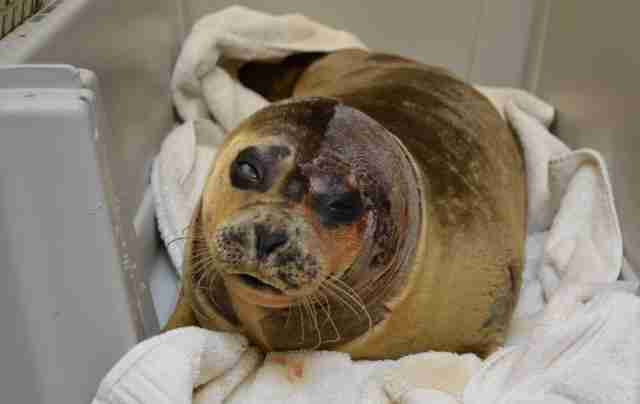 "If there's one message I'm getting out, it's if you see a seal on the beach, let him be. Often mom is coming back. 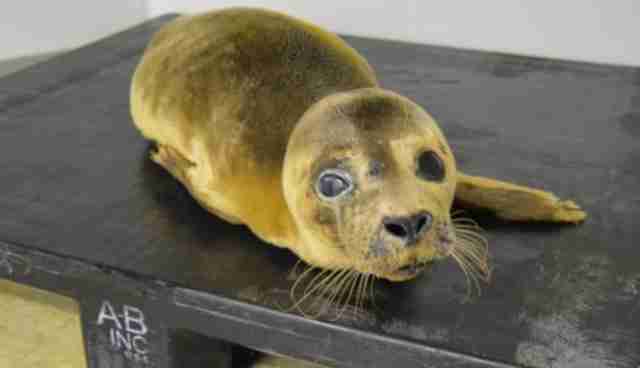 And call the seal rescue group in your area so we can check it out." Onion Flake, on the other hand, wasn't an orphan. Just really, really unlucky. "He was what's called a weanling when rescued," Zagzebski explains. "He had probably been on his own for two or three months by that time and he just got sick." "There are two really vulnerable times for seals," she says. "One is that first month when mom is leaving them on the beach. "The second is right after they've been weaned and on their own for a couple of months - they're still young animals, they're still really fragile and they're subject to a lot of illnesses." In Onion Flake's case, he caught just about every one of them. But he also caught the eye of compassionate people who helped who got him back on his flippers again. Help support his journey back to the sea here.